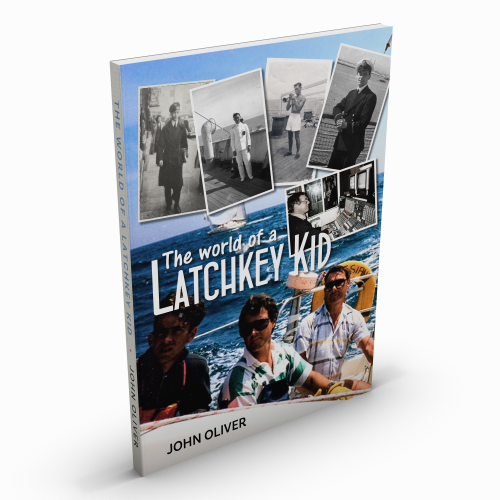 IN THIS ENTERTAINING memoir, John Oliver looks back on a lifetime of experiences involving waves of one kind or another. Ocean, radio and sound waves have all played their part in his life and his various occupations. Born in the East End of London, John was 8 years old at the outbreak of World War II and experienced the entire London Blitz at first hand. His parents both worked long hours so as a wartime schoolboy he was a ‘latchkey kid’ who learned to look after himself. When the war was over he wanted to escape the East End and see something of the world and with that in mind he secured employment with the Orient Shipping Line. After working at their London office for a while he was sent to a Naval Training School and, at the age of sixteen, put to sea for the first time as a commis waiter aboard the luxury ocean liner RMS Orion. It was to be the start of many adventures around the world over the next few years. John discovered that he had a talent for boxing – a popular sport on board ships at the time – and he soon found himself taken on by a promoter and slugging it out with a variety of opponents in front of a noisy crowd. His pugilistic skills would later come in handy on numerous occasions – both in and out of the boxing ring. He was also a musician, having learned to play the trumpet in the Boy’s Brigade, and took part in ship’s concerts and other musical events whenever the opportunity arose. After many adventures around the world John returned to the UK determined to train as a Ship’s Radio Officer – quite an ambition for someone with no formal qualifications but, despite the difficulty, he succeeded and returned to sea as an officer for the next few years, racking up many new experiences. Having married and started a family, life at sea became impractical and John decided to obtain a job ashore. His skills led him to an entirely new career in broadcasting as a sound technician with ABCtv and later Thames TV. In the course of his work over the coming years he would travel all over the UK, working with numerous famous broadcasters and meeting many VIPs. Whilst working in broadcasting John began yacht racing and soon became hooked. This led eventually to owning his own Sigma 33 OOD racing yacht Ephesian, in which he and his three sons raced for a number of years, winning numerous trophies. All these experiences, plus many more besides, are revealed in full in this enjoyable record of a remarkably eventful life. John Oliver's family has a strong historical connection with the Whitechapel Bell Foundry, the oldest manufacturing company in the UK, having been continuously in business for over 500 years. John's great-great-grandfather was involved in making London's most famous bell 'Big Ben' and rode through the streets of London sitting on top of the bell as it was delivered from the foundry to its current location in the tower at the Houses of Parliament in Westminster. Details of this interesting family connection are given in one chapter of the book.